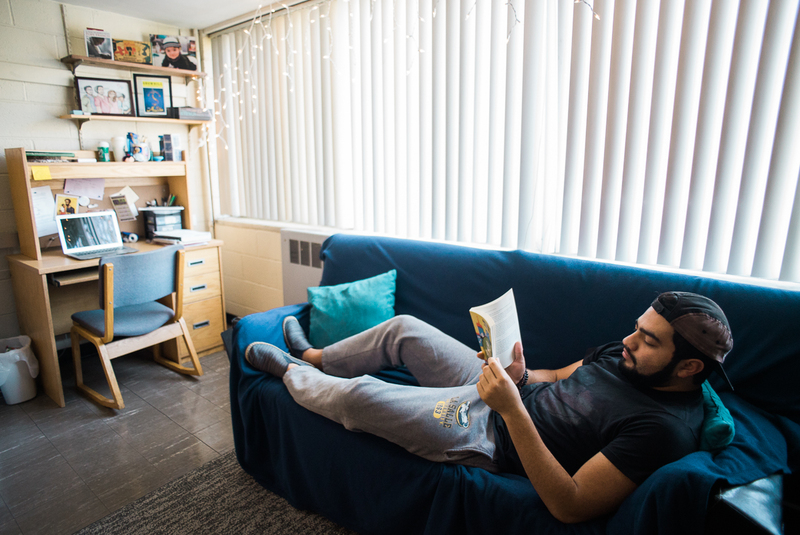 These residence halls are located at the corner of 20th Street and Olney Avenue and offer a variety of room styles, which include double rooms (11’x17’) and single rooms. The residence halls are co-ed by floor. The mailroom for the north halls residents is adjacent to the entrance of the complex. *Please note that St. Katharine hall also offers quad units. these units include two double rooms with an adjoining bathroom. No single rooms are available in St. Katharine hall. St. Neumann is adjacent to St. Basil Court, the Communication Center, the IBC Fitness Center, and Treetops Café. Double rooms, standard triples, and single rooms are available. St. Neumann offers the same features as North Halls with the addition of a multi-purpose lounge that includes a large screen cable TV, a pool table and a full kitchen. The mailroom is located in the lobby of the neighboring Treetops Café. St. Basil Court is adjacent to the baseball field, IBC Fitness Center, St. Neumann, and Treetops Café. This facility features suites and double rooms which are co-ed by unit. Suite style rooms feature two double bedrooms with a shared entrance and bathroom with two vanities. Floors with double rooms contain separate men’s and women’s bathroom and shower facilities. This facility is air-conditioned, equipped with a fire sprinkler system, and offers common areas located at the end of each floor, a dance studio, a group study lounge, and a large group lounge. The mailroom for St. Basil Court residents is located in the lobby of the Treetops Café. These apartments are located on the corner of Chew and Wister Streets and house students in fully furnished, two-bedroom, three-person units. La Salle Apartments residents may retrieve their mail at the North Halls Mailroom. These apartments are located one block west of the La Salle Apartments and house undergraduate and graduate students in fully furnished, one-bedroom (two-person undergrad/one-person grad) and two-bedroom (three-person undergrad/two-person grad) units. St. Teresa Court residents retrieve their mail from the St. Miguel Mailroom. Graduate students wishing to live in St. Teresa Court must complete the Application/Occupancy Agreement for graduate housing and return it along with their housing deposit.